The Northern Virginia Coalition of Equestrian Organizations, Inc. is an alliance dedicated to the preservation and prosperity of the equestrian community in Northern Virginia. The NVCEO is open to all equestrian social groups, riding clubs, breed clubs, youth groups and other equestrian organizations in Northern Virginia, regardless of disciplines. In addition, businesses related to, and in support of the horse industry, are encouraged to join the NVCEO, Inc. as Commercial Members. 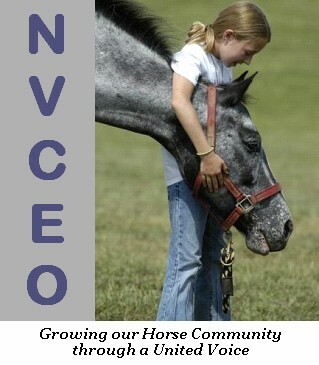 The NVCEO represents thousands of equestrians belonging to 19 separate member organizations throughout the region. The primary goal of the Coalition is to preserve and grow the horse community of Northern Virginia. As a business that supports our horse industry in Northern Virginia, we encourage your business to partner with the NVCEO by becoming a "Commercial Member" of the Coalition. As the Coalition builds a united voice for our horse community in Northern Virginia, your alliance with us is critical to helping us achieve our goals. Commercial Membership in the NVCEO is a nominal $50 annual membership fee. Your business will directly benefit from membership in the Coalition. Commercial members are invited to attend all Coalition functions and activities. Each commercial member will have a "highlighted" listing in our annual "Community Guide" which is distributed to every member of all Coalition Member Organizations. Thousands of horse owners in Northern Virginia use this Community Guide to make their buying decisions. In addition, Commercial Members are listed on our online Business Directory, which will be completed restyled and redesigned in 2011.